The budget documents contain the budget positions which can be called up by the users in all InLoox PM Web App projects on the budget page. The budget positions can be edited or deleted in the InLoox PM Web App options as required. To manage the templates you need the InLoox PM Web App administrator permissions. For more information, where you can find the InLoox PM options, see Open the InLoox PM options. Add a new budget position by clicking New. 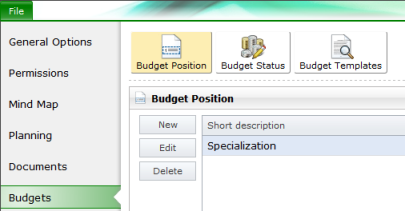 In the Budget Position dialog box type a new name in the Name field. Type additional information in the Description field. Enter the number you want in the Quantity field. In the Pricing area click New to add a new position. In the Unit and Prices dialog box enter a Name, Purchase and Disposition Price and click OK. Choose a group in the Group(s) list. The created pricing model will be loaded, if you select this position in the New Budget Position / Edit Budget Position dialog box in the project. For the detailed description on how to create a budget position see Create and edit a budget position. Change the budget positions list by clicking Edit, Delete, Up or Down. Click OK after you made all changes you wanted. Edit the already existing budget position in the Budget Position list. Choose one from the list and click Edit. In the Budget Position dialog box you can make changes you want (see the first point). Remove the budget position from InLoox PM Web App by clicking Delete. The name of each budget position should be short and unambiguous. How to Edit Budget Templates in InLoox PM 7 Web App • Copyright 1999-2019 © InLoox GmbH. Tutti i diritti riservati.